The corn breeding industry is expanding in Hawaii*. The pineapple industry is contracting. People seem to be blaming the second on the first, and are passing this article around. My reading of the article, and some other statistics I looked, don’t seem to agree with the story line (evil GMO seed companies driving out the pineapple industry) that people seem to be suggesting. Yes, Monsanto did buy out one of Hawaii’s three remaining large pineapple growers several years ago (as of 2007 there were also 49 small pineapple producers growing pineapples on 1-15 acres and a single medium sized grower with between 100-250 acres), but Maui Land & Pineapple Co., the company this article talks about, isn’t selling out to a seed company, they’re switching to the production of other crops instead of pineapples. One company sells its land and shuts down, another stays in the farming business but gives up on pineapples and announced plans to grow a more diverse range of crops. To me, that suggests it is becoming harder and harder to make a profit growing pineapples in Hawaii. The data I could find on pineapple production and consumption is suggestive (though not conclusive) of a domestic industry being driven slowly out of business by foreign imports. From 1996 to 2005 the average American went from eating less than two pounds of fresh pineapple per year to 4.9 pounds per year (an increase of ~160%). Yet in roughly the same timeframe (1998-2005), American production of pineapples dropped 40% (from 354 short tons to 212 short tons). To make the figures exactly comparable I can cut out the first two years of pineapple consumption data. From 1998-2005 per capita consumption of fresh pineapples increased 78%. Where are the extra pineapples Americans are eating coming from? 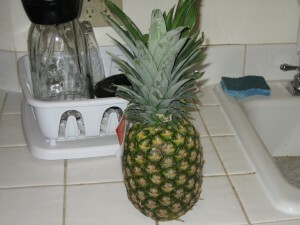 Either consumption of canned pineapples and pineapple juice (the only other significant uses of the fruit) is decreasing drastically enough to compensate for decreased overall growth of pineapples, people eating more fresh pineapples AND population growth or alternatively a lot more pineapples are being brought in from outside the country. Increased imports drive prices for pineapples grown in America down, and Hawaiian pineapple farms start going out of business. I wish the Hawaiian pineapple industry wasn’t disappearing. It is sad for all of us who picture Hawaii as a land of exotic fruits. ** It is terrible for the people who are losing their jobs (and probably won’t find new ones soon in today’s economy). If anyone has other data that suggests the seed companies are the culprit, or has any sort of direct experience with the papaya industry and would like to comment I’d be happy to publicize it hear. Oh and one final question? Does anyone know if there is any organic corn grown in Hawaii? The USDA’s usually awesome agricultural statistics didn’t mention any as of 2007. *The article mentions the Hawaiian seed industry had $176.6 million in revenue in this year, with growth of 26% over the past year. To put that in perspective, two years ago in 2007 (the most recent date for which I could find data) the crop sector of the Hawaiian economy, including seed production, was worth $430 million. The seed industry in Hawaii today is worth 41% of what their entire crop sector was worth two years ago. **When want to picture corn I think of home.